Photoshop Elements files can be saved in a variety of different formats using the Save As dialog box. Some format types require you to convert a color mode before the format can be used. Therefore, a relationship exists between file formats and saving files. Additionally, bit depth in images also relate to the kinds of file formats you can use when saving files. In most any program, the Save As dialog box is a familiar place where you make choices about the file to be saved. With Save As, you can save a duplicate copy of your image or a modified copy and retain the original file. To use the Save As dialog box, choose File→Save for files to be saved the first time, or choose File→Save As for any file. The Save As dialog box then opens. File name: This item is common to all Save As dialog boxes. Type a name for your file in the text box. Format: From the drop-down menu, you select file formats. Include in the Elements Organizer: If you want the file added to the Organizer, select this check box. Save in Version Set with Original: You can edit images and save a version of your image, but only in Edit Quick mode. When you save the file from Edit Quick mode, this check box is active. Select the box to save a version of the original, which appears in the Organizer. Layers: If your file has layers, clicking this check box preserves the layers. As a Copy: Use this option to save a copy without overwriting the original file. Color: Select the box for ICC (International Color Consortium) Profile. Depending on which profile you’re using, the option appears for sRGB or Adobe RGB (1998). When the check box is selected, the profile is embedded in the image. Thumbnail (Windows only): If you save a file with a thumbnail, you can see a miniature representation of your image when viewing it in folders or on the desktop. If you select Ask When Saving in the Saving Files preferences, the check box can be enabled or disabled. If you select an option for Never Save or Always Save in the Preferences dialog box, this box is enabled or disabled (and grayed out) for you. You need to return to the Preferences dialog box if you want to change the option. 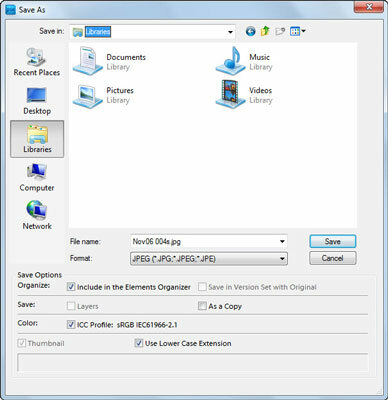 Use Lower Case Extension (Windows only): File extensions give you a clue to which file format was used when a file was saved. Elements automatically adds the extension to the filename for you. Your choices are to use uppercase or lowercase letters for the extension name. Select the check box for Use Lower Case Extension for lowercase or deselect the check box if you want to use uppercase characters in the filename. You save files for Web hosting in a different dialog box than when you’re saving files for other output. Choose File→Save for Web, and the Save for Web dialog box opens.